“Abu Adam al-Muhajir” is an ISIS propagandist on Twitter purportedly living in ISIS-controlled territory. He tweets about his journey to the so-called caliphate and his experiences living there. Al-Muhajir proudly declares he lives in ISIS-held territory. Al-Muhajir criticizes Westerners who “have never seen a knife properly let alone a gun.”Abu Adam al-Muhajir, Twitter post, July 23, 2015, 8:34 a.m., https://twitter.com/IronMuhajir/status/624241235289620481. Even women and children carry knives and guns in the so-called Islamic State, he tweeted on July 23, 2015.Abu Adam al-Muhajir, Twitter post, July 23, 2015, 8:38 a.m., https://twitter.com/IronMuhajir/status/624242171298902016. Al-Muhajir has also tweeted his pride at seeing children carrying weapons and imitating ISIS fighters. Al-Muhajir praises the concepts of jihad and martyrdom. There is “no better feeling than when the call comes for jihad,” he tweeted on July 23, 2015.Abu Adam al-Muhajir, Twitter post, July 23, 2015, 3:26 a.m., https://twitter.com/IronMuhajir/status/624163642792148992. 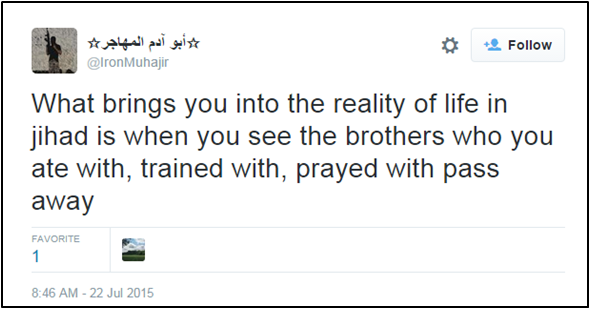 Al-Muhajir has tweeted praise for other ISIS fighters, comparing them to family. 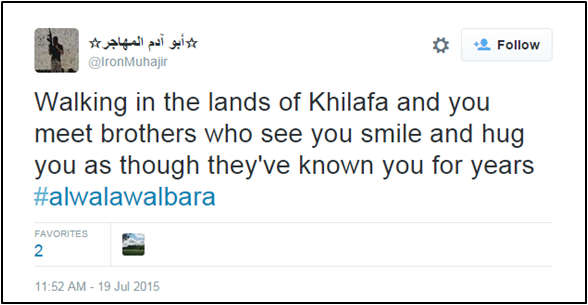 Al-Muhajir has also tweeted about his amazement upon meeting different types of immigrants to ISIS-held territory. He praises ISIS for accepting and training foreign fighters. One series of tweets in July 2015 described how al-Muhajir crossed the border into Syria from Turkey with a group that included young children, and was almost caught by Turkish security forces.Abu Adam al-Muhajir, Twitter post, July 29, 2015, 9:16 a.m., https://twitter.com/IronMuhajir/status/626425978928152576. He described meeting ISIS forces across the border, writing “there was not a happier sight that day.”Abu Adam al-Muhajir, Twitter post, July 29, 2015, 9:28 a.m., https://twitter.com/IronMuhajir/status/626429214129000448. ISIS then “sheltered us, fed us, clothed us, trained us, protected us and taught us with Allah's mercy,” according to al-Muhajir.Abu Adam al-Muhajir, Twitter post, July 28, 2015, 12:16 p.m., https://twitter.com/IronMuhajir/status/626108938551984128. “Abu Adam al-Muhajir” is an ISIS propagandist on Twitter purportedly living in ISIS-controlled territory. “The brother shouted for the password and the murtad looked left and got shocked. He couldn't answer. We took him out then checked him” (Tweet)Abu Adam Muhajir, Twitter post, September 1, 2015, https://twitter.com/IronMuhajir2/status/638768586023129088. “When we capture sahawat, nusayri, pkk, etc. soldiers, they don't even dare to pick their head up to look at us although” (Tweet)Abu Adam Muhajir, Twitter post, September 1, 2015, 8:35 a.m., https://twitter.com/IronMuhajir2/status/638737031192018944. “And it humbles you. Being out in jihad took me to more places than I ever did before hijra. Free tourism for the sake of Allah...” (Tweet)Abu Adam Muhajir, Twitter post, August 31, 2015, 2:41 a.m., https://twitter.com/IronMuhajir2/status/638285456849944576. “The night I was crossing from Turkey into the State, It was hectic. We ran through the fields in mud. The Turkish authorities saw us” (Tweet)Abu Adam al-Muhajir, Twitter post, July 29, 2015, 9:13 a.m., https://twitter.com/IronMuhajir/status/626425333206663169. “We came here with nothing and Dawla sheltered us, fed us, clothed us, trained us, protected us and taught us with Allah's mercy” (Tweet)Abu Adam al-Muhajir, Twitter post, July 28, 2015, 12:16 p.m., https://twitter.com/IronMuhajir/status/626108938551984128. “[W]henever I go into a army shop wallah I run around smiling and don't want to leave. I just feel like buying everything especially pistols” (Tweet)Abu Adam al-Muhajir, Twitter post, July 28, 2015, 5:58 a.m., https://twitter.com/IronMuhajir/status/626013904863404032. “[S]earching for his freedom? How can you beat the one that sees his life in his death? Strange how these kuffar fight a losing war” (Tweet)Abu Adam al-Muhajir, Twitter post, July 25, 2015, 8:07 a.m., https://twitter.com/IronMuhajir/status/624959083343446017. “How can you beat the one that looks down the barrel of the gun and smiles? How can you beat the one who rushes to the battlefield” (Tweet)Abu Adam al-Muhajir, Twitter post, July 25, 2015, 8:00 a.m., https://twitter.com/IronMuhajir/status/624957327163138048. “@UmmExtreme yeah alhamdulilah. Loveliest thing is the children buy toy guns and wear military clothes and run upto us just to give salam” (Tweet)Abu Adam al-Muhajir, Twitter post, July 25, 2015, 6:16 a.m., https://twitter.com/IronMuhajir/status/624931196510830592. 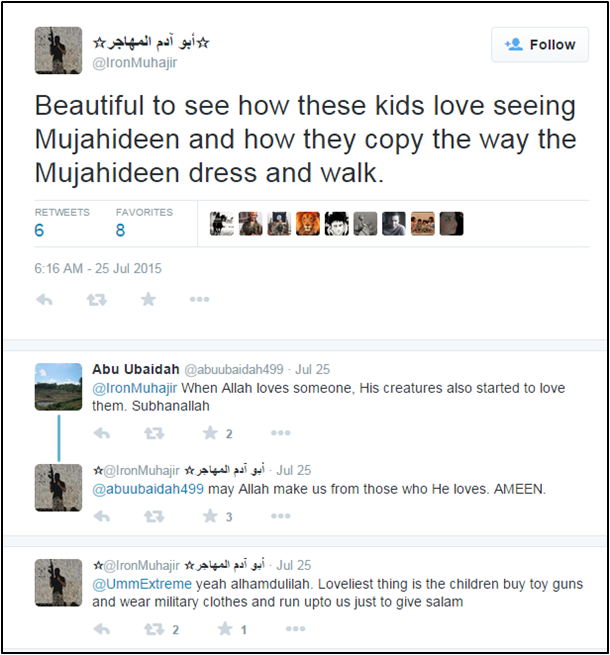 “Beautiful to see how these kids love seeing Mujahideen and how they copy the way the Mujahideen dress and walk.” (Tweet)Abu Adam al-Muhajir, Twitter post, July 25, 2015, 6:16 a.m., https://twitter.com/IronMuhajir/status/624931196510830592. “They feel secure without weapons. How strange. Here even our women and children carry knives and guns. What better security is there?” (Tweet)Abu Adam al-Muhajir, Twitter post, July 23, 2015, 8:38 a.m., https://twitter.com/IronMuhajir/status/624242171298902016. “The people living in the west and in the lands of its allies have never seen a knife properly let alone a gun. Now I find that strange.” (Tweet)Abu Adam al-Muhajir, Twitter post, July 23, 2015, 8:34 a.m., https://twitter.com/IronMuhajir/status/624241235289620481. “When I first came to the Khilafa I lived 4 months or so without spending a dime walhamdulilah. Goes to show the generosity of this dawla” (Tweet)Abu Adam al-Muhajir, Twitter post, July 23, 2015, 8:16 a.m., https://twitter.com/IronMuhajir/status/624236662516793345. 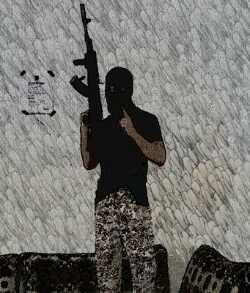 “There's no better feeling than when the call comes for jihad. 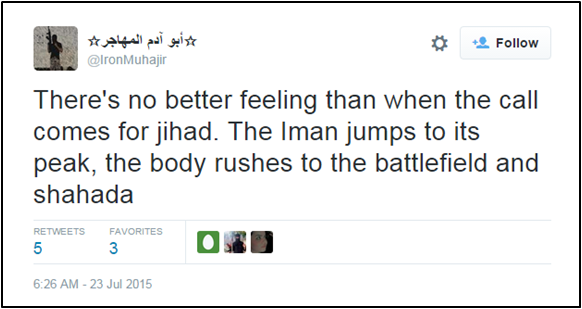 The Iman jumps to its peak, the body rushes to the battlefield and shahada” (Tweet)Abu Adam al-Muhajir, Twitter post, July 23, 2015, 3:26 a.m., https://twitter.com/IronMuhajir/status/624163642792148992. “What brings you into the reality of life in jihad is when you see the brothers who you ate with, trained with, prayed with pass away” (Tweet)Abu Adam al-Muhajir, Twitter post, July 22, 2015, 5:46 a.m., https://twitter.com/IronMuhajir/status/623836467517870080. “There are 3 things that one needs in jihad. Without these things, ones Iman will fall like rain leaving one failing in times of hardship.” (Tweet)Abu Adam al-Muhajir, Twitter post, July 21, 2015, 12:03 p.m., https://twitter.com/IronMuhajir/status/623568905089511424. “Alhamdulilah. It's amazing how Allah revealed this disgusting filth. Wallah we would never have known he was a spy.” (Tweet)Abu Adam al-Muhajir, Twitter post, July 20, 2015, 6:26 a.m., https://twitter.com/IronMuhajir/status/623121857697435648. “Walking in the lands of Khilafa and you meet brothers who see you smile and hug you as though they've known you for years #alwalawalbara” (Tweet)Abu Adam al-Muhajir, Twitter post, July 19, 2015, 8:52 a.m., https://twitter.com/IronMuhajir/status/622796211653865472. “Quran in my right hand and Kalashnikov in my left as I walk to my Lord.” (Tweet)Abu Adam al-Muhajir, Twitter, accessed August 7, 2015, https://twitter.com/IronMuhajir.